If you've been involved in a crash, hurt on the job or injured due to medical malpractice you may be due some sort of compensation for lost wages or other losses. Sometimes in the midst of all the legal happenings clients can make some costly mistakes that have the potential to ruin their personal injury lawsuit. We here at Parry & Pfau have compiled a list of the "Top Seven Mistakes" we see clients inadvertently make, most of which are preventable. By far the biggest self-sabotage in your personal injury case is lying. It is extremely important to be upfront and honest with your lawyer. Trust us, we've heard it all before so no need to hide any facts from us. Remember, a lie almost always comes to light so it's just a waste of time, money, and energy to lie. Oh boy, this can be the kiss of death for many people. Whether you're the plaintiff or defendant, anything you say on Facebook, Twitter or other social media platform can be used against you. The safest and usually smartest thing to do (and what we recommend) is not post anything at all until your case has officially ended. This sounds pretty obvious, but you'd be surprised how hard it is sometimes for people to get us signed documents back in a timely fashion. This also includes being aware of the statute of limitations, because some cases expire in as little as a year. 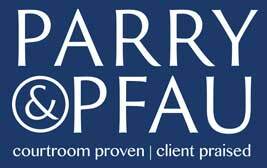 Consult with a Las Vegas Personal Injury team like Parry & Pfau as soon as possible following an accident or injury. Is your voicemail message unprofessional? Are your emails lewd or full of foul language? We certainly hope not because all of those can be used as evidence in your case, too. Attorneys for the other side can impugn your image and destroy your credibility. Just as with social media, assume anything you say or write can appear in front of a judge or jury so tread lightly. DO NOT, we repeat, DO NOT miss any medical appointments or exams. It is to your advantage to also listen to your doctor's recommendations. If you choose not to, it can show a judge or jury that you don't value your recovery and aren't taking the case seriously. It will also undoubtedly affect your recovery. This should go without saying but hold onto all documents, prescriptions, pictures or other forms of evidence you have from your injury. This can include the day of the collision, as well as doctors visits/insurance exams. Personal injury cases are not meant for you to get rich quick. They are designed to get you compensated for losses you've incurred. It's your job to get better, and it's our job as your attorneys to handle the lawsuit. Remember these facts and your case will go much more smoothly. If you think you have a case but aren't sure where to go or what to do, give our office a call. We'd be happy to meet for a free consultation to go over things.